This is the last of the winter issues (sob! ), but at least it’s full of what Patrones do best – coats!! I even like the coat on the cover, though I like it better without the enormous bow. 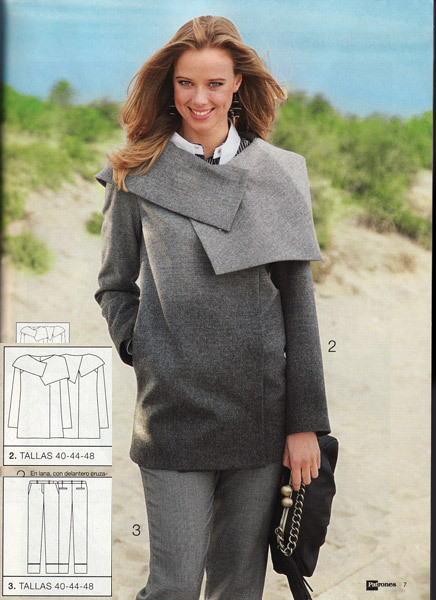 In the first coats feature (on that “Patrones beach” we’ve seen in pretty much every issue), I rather like this big, asymmetrical collar coat, but it does remind me of the Vogue Armani-knockoff pattern so many people have made (and I’ve loved, too). This topstitched, seamed jacket just oozes cool. The detailing is just fantastic on this, too – they even added a little pouch to the belt! 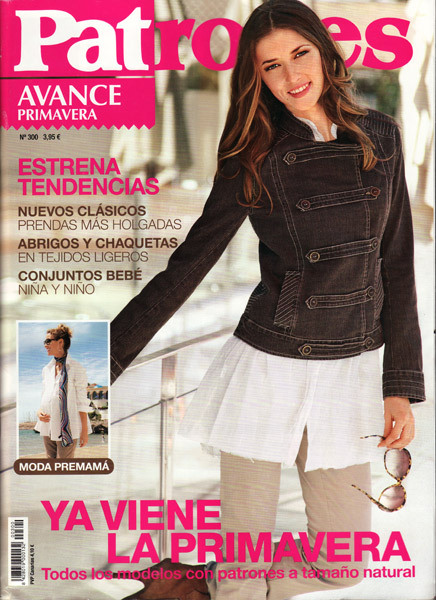 This is supposedly the first Spring issue, but for me it seems a strange mix of wearable jackets and office wear (yay!) but with a bunch of summery sleeveless tops and shorts (boo!). Who wears shorts when there’s still frost on the ground? 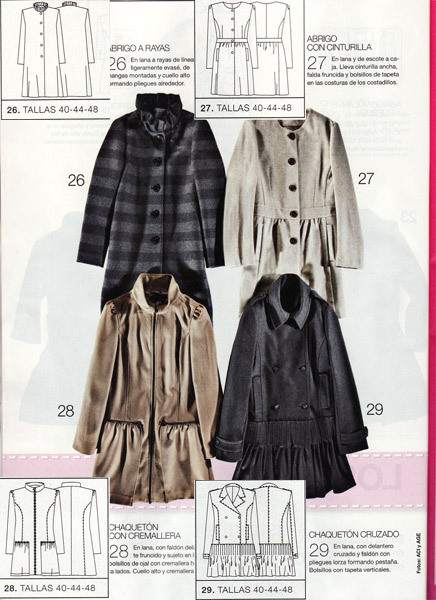 The jacket itself is quite a standard short trench design, but I love the use of zipper teeth here as trim! Wow! I really like the detailing on the topstitched military jacket shown on the front cover, especially the back view with the bias topstitching at the lower back. Loads of magazines are doing the nautical theme again this year, but for me, this cropped peacoat with white braid trim is the absolute pinnacle of the maritime look. It’s so good I’d even wear it, and I go out of my way to avoid any boaty clichés (for obvious reasons). 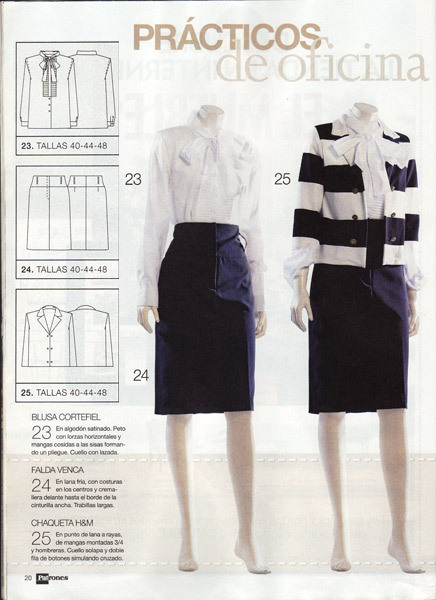 This page is from a very nicely styled and very wearable office wear section. I really like the high waisted navy skirt with the subtle curved yoke shaping and well-placed belt loops. I’m always a sucker for cowl necks, so of course I love this blouse, paired with some equally great high waisted trousers! Also included is a rather nice (and new!) maternity section, plus three baby patterns. Look beyond the ill-fitting sausage casing and bad fabric (seriously, bubble wrap??) and this could be a knockout dress, although with any strapless dresses, you need a LOT of internal support to keep everything in place. I love this dress with a peephole above the bust! If I made this I’d cut the upper left piece in contrast fabric to really show off the asymmetrical piecing over the flash of flesh. How gorgeous is this draped wedding gown?? I ordered this issue because it was a bit of a mystery – It’s an “Extra” issue, but with new numbering (“3” rather than, say, “302”), and labelled as “Costura Facil” (“Easy Sewing”). But seriously there is NO difference that I can see between this and the regular issues of Patrones. Same complexity of designs, same instructions, same everything. 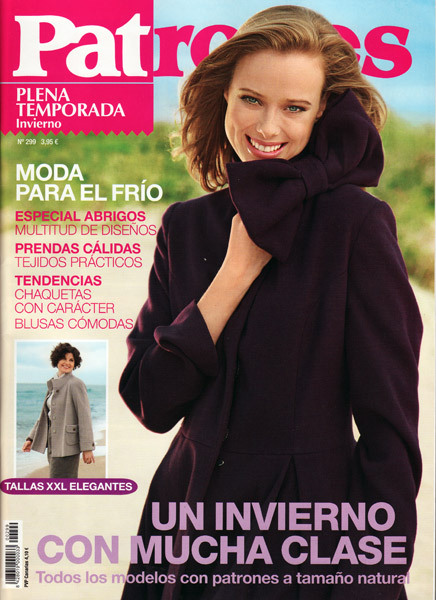 I thought maybe this was going to be the Patrones equivalent of Burda’s “Easy fashion” magazines, but it’s definitely not. It’s truly a mystery as to why they labelled this “easy”! I quite like the look of these orange cargoes, though this whole feature felt kinda dated to me, like maybe it was a repeat from the early 90s or smething. As for something that could in no way be considered easy, check out the fantastic welt pockets on this peacoat! I love the seaming on these linen trousers, but what is it with all the orange trousers in this issue?? There’s a great and very stylish little black dress feature at the back, and this cutaway dress is my favourite from it. In addition to the cutaway, there’s some great seaming interest in the body, too. And finally, here’s a nice knit wrap dress, with the H&M label clearly showing. Alongside another garment with a Morgan de toi label showing, it’s obvious that Patrones are still copying high street and designer clothing, they’re just not able to tell us where it’s from for most of the clothes! So seeing as how Patrones have fully transitioned into shorts and strappy tops, this will likely be my last issue for a few months until they start their Fall fashions again near the end of the year. 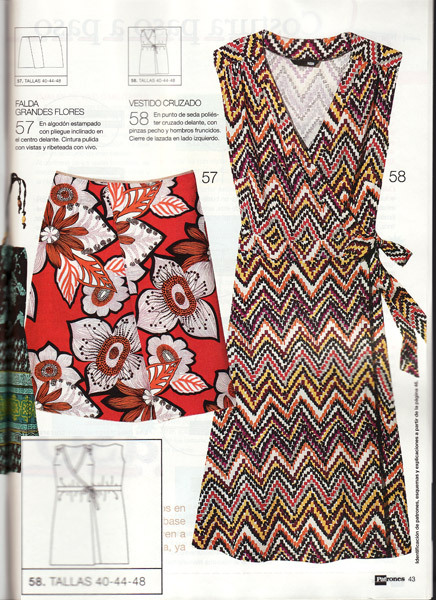 Luckily, Brazil is just starting their Fall so with a bit of luck I’ll have some great Manequim patterns to fill in the gaps!